In the Chart Module, at the middle right, check the Treatment Plans box. This will display Treatment Plans and Procedures grid instead of Progress Notes. This view also allows you to create new treatment plans from the Chart. To turn this option on, check the Treatment Plans box on the Enter Treatment tab. This checkbox only shows when Is TP View is also selected for the Chart View on the Show tab. Active and inactive treatment plans list in the Treatment Plans list. Saved treatment plans do not. When you select a treatment plan, its procedures will show on the graphical tooth chart and list under Procedures. 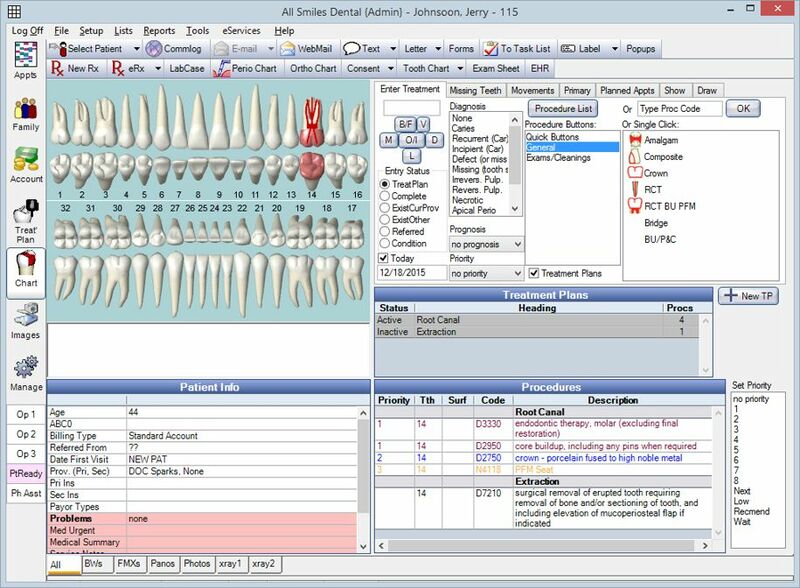 If you select all treatment plans, all treatment planned procedures all procedures will show in the graphical tooth chart and list under Procedures. If no treatment has been entered for a patient, the Treatment Plans list may be blank. As soon as you chart any treatment, an Active Treatment Plan is created that contains the treatment planned procedures. Heading: Enter the name of the new treatment plan. Note: Change the note if desired. Set the default note in Treatment Module Preferences. Use the left/right arrows to copy procedures that are already part of a treatment plan to or from the Treatment Planned Procedures list. Treatment Planned Procedures: The procedures in this treatment plan. Available Procedures: Procedures added to other active or inactive treatment plans. To make this plan active, click Make Active Treatment Plan. The Status column indicates the procedure's status. Once a procedure is complete, it no longer lists as an available or treatment planned procedure. TP: Procedure is part an active treatment plan. TPi: Procedure is part of an inactive treatment plan. The Apt column indicates the appointment status of the procedure. A procedure can have more than one status. blank: Procedure is not planned, scheduled, or part of a broken appointment. P: Procedure is part of a planned appointment. S: Procedure is scheduled. These procedures cannot be removed from an active treatment plan. U: Procedure is part of an appointment on the Unscheduled List. These procedures cannot be removed from an active treatment plan. B: Procedure is part of a broken appointment. These procedures cannot be removed from an active treatment plan. You can add procedures to a single treatment plan or to multiple treatment plans at once. Chart treatment as normal (select teeth, add procedures). As procedures are added, the graphical tooth chart will reflect the changes. If no treatment is selected prior to charting treatment (e.g. when not in TP view), procedures will be added to the active treatment plan. If no active plan already exists, a new one will be created. Under Set Priority, click the priority level. Options are set in Definitions: Treat' Plan Priorities. One treatment plan will always have an active status. However the active treatment plan can be replaced. Double click the treatment plan to make active. Click Make Active Treatment Plan.